Today was chemo day number one. I was very apprehensive. It wasn’t the infusion that scared me. I was worried about my port. Let’s cut to the chase. It was easy and mainly painless. It was also very different. The treatment center, across from Hoag Hospital in Newport Beach but part of the USC Keck Medical Center, is in a nondescript two story building. When it was my turn a nurse came down from the second floor to bring Helaine and me up. The treatment area is a large room with chest high partitions. It’s all very open. Everyone is visible to everyone. Helaine counted 21 stations. There are probably more private rooms for less able patients. I was seated in a comfortable lounger chair. My nurse, Carrie, inserted a needle into my port. It hurt for a second. The port acts as both exit and entrance. Carrie started by drawing a blood sample. 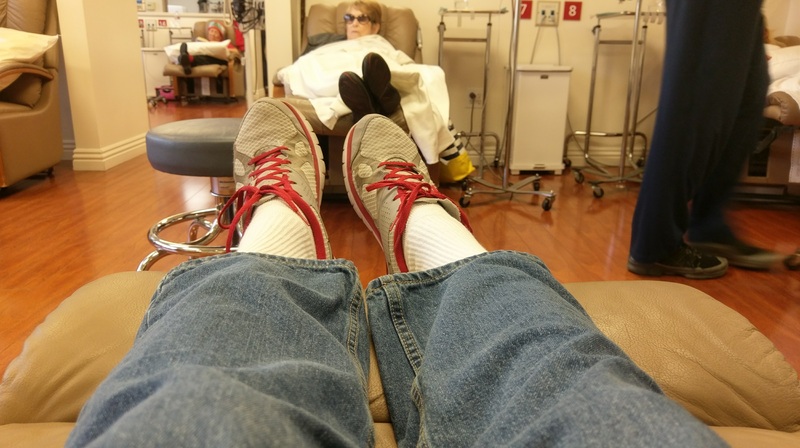 Because chemo greatly affects blood chemistry mine will be looked at every time I sit in the chair. Today my readings were all in the healthy range. She came back and hung a few bags of solution on a stand next to me. First came an anti-nausea drug. Next my chemo drug. The bag is ominous. A label warns what’s inside is TOXIC. It’s a BIO-HAZARD! Thank god they don’t put that stuff insid… hold on… WTF! Side effects from chemo aren’t instantaneous. If (and it’s a big if) chemotherapy is going to make me sick, it’s a few days away. Right now I feel fine. 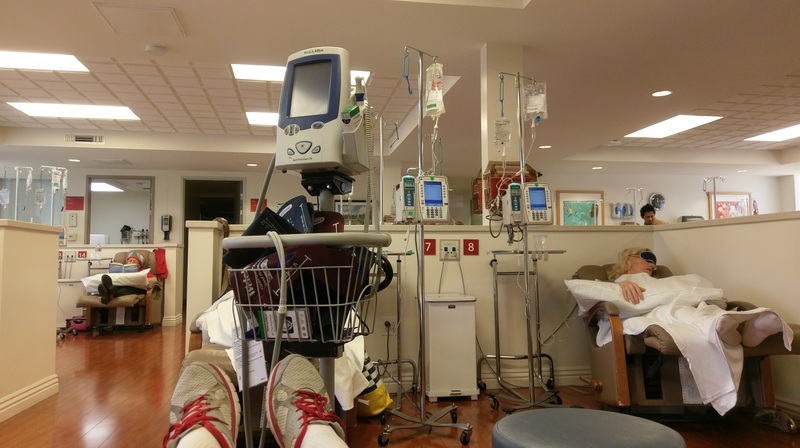 The chemo was an easy experience. The process was fairly gentle. Let’s hope it stays this way. Thank you for sharing and I’m glad it went well. Happy Thanksgiving! 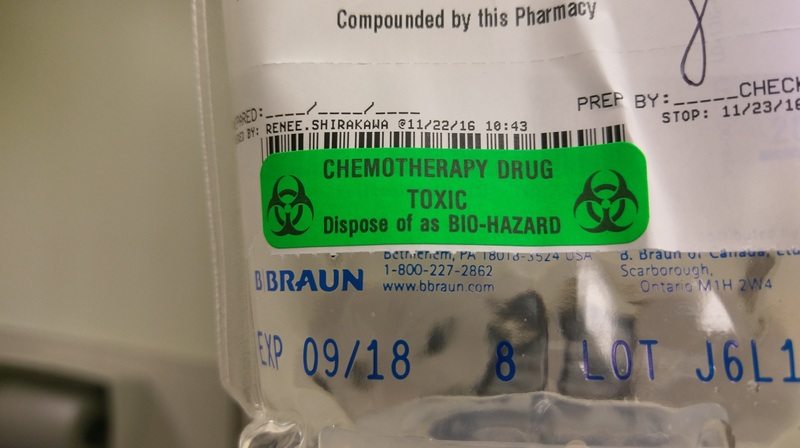 Geoff,Your Chemo description is perfect. It was scary at first & Accessing the port for the first time was a little tuff, but after the initial burn its alot easier than all those IVs I had prior. Like I said in the earlier text “Take it one day at a time” and you will be fine. There is a place like this on Woodland Street in Hartford. The building is non-descript and called Gotham Park down the street from CPTV and WNPR. I take my dad there every 3 months for blood work. If he needs a Procrit shot to help his kidneys, we go down the hall and into the other part of the buildings. Just like you have there. Big comfortable chairs and the roll-around stands with the chemo cocktails. Can’t help but go into prayer mode and pray for these folks. After my Dad’s shot and as we leave, I say out loud good luck to all there and make the sign of the cross towards all of them. The room fills with thank-you’s. God help them all and you for good health and a speedy recovery. I wish you and your family all the blessings of Thanksgiving and pray your treatment works quickly and gently. On another, slightly less important level, nice sneaks . . .
Just be very careful. Try not to expose yourself to anyone that is sick. The chemo will destroy your body’s ability to fight even a common cold.